They are alot questions/ideas that came to my Mind when creating this Powers Up. 1.) Different People, Teams, groups, families, etc. speaks different languages, hence good communication is very necessary for people from different works of life. what if trello can allow Users write comments on post on different langauges of their choice. For instance an Arab guy can comment in Arabic and translate the Comment to sweedish for her sweeden fiance to see. An American guy can write comments in English and post it to trello in Latin. 2.) How can Trello Users Converts their Trello Card & Comments into Rich Text Comments (Eg. Italize, Bold, Add Colors,Images, Links etc) in the context of what you see is what you get(WYSIWYG). This will enable Trello Users to easily convert trello comments into Articles, Bloggings,Lecturing Notes etc. from and withinthe context of Trello Application.. 4. )Attaching Screenshots as files has become the talk of the day. The Question is? How can Trello Users attach a Screenshotsof any Websites, Articles, Bloggings etc. as files attachments to Trello Card from and within the comfort of Trello Application Components. Alot of Team collaborations is happening on Facebook. Businesses, Team events, Educational Research normally occur on different FaceBook Pages.This allow Trello Users to easily attach their Facebook Page Photos and Posts directly to Trello Cards. Okay you have alot Business Clients you wants to periodically send products or adverts to. Okay you want to send a real-time notifications alerts to all your Board Meeting Members ahead of time. Okay You have created a Birthday Event Cards and have a party to Celebrate and you dont want anybody to be left out. How can one send a real-time notifications to effect this?. How can one shedule this notifications to be triggeredin a later time.? I believe Trello has answer to this. Since Trello sends Email notifications to all members of the Cards regarding any updates, The app automatically schedule Trello Comments to be triggered on the selected date and time. This message is automatically send to trello System on the scheduled date as well as the cards Members Mobile Devices. What makes your Power-Up awesome? 1.) Ability to translate trello Comments into any different language of choice. 2.) Ability to convert trello Comments into Rich Text Comments (Eg. Italize, Bold, Add Colors,Images, Links etc) for Article Publications, Bloggings, Lecture Notes,Presentations etc. 3.) Ability to send Trello Comments as SMS Messages to members Mobile Devices. 6.) Ability to attach any Web Pages as Files to Trello Cards..
How will this Power-Up make the lives of Trello users who use it better? 2.) Easily Enrich Your Trello Comments Eg. Add Bold, Links, Images,list etc to trello comments. Organize Your Trello Comments into Presentations, Bloggings, Lecture Notes etc using HTML & MARKDOWN Editing tools. 3.) Easy Screenshots File Sharing. 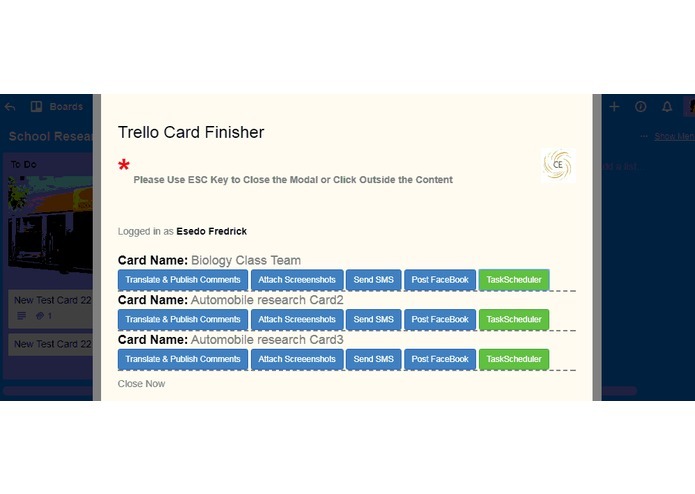 Capture screenshot of any web pages and attach to trello cards automatically. 4.) Send and Schedule your Business, Educational and Social activites on trello via Trello Comments and SMS Messaging Protocols. 5.) Easily Attach and send your FaceBook Page Photos and Cards as Attachments and Comments to trello Cards Rescpectively. 1.) Testing can be done with any registered Trello User Account. 2.) When accessing the power up, during authentication, it might required you to enable your Browser popup so that Trello Power Up Authentication will flow successfully. 3.) Once You are in there, You will see your Trello Fullname from within the Trello powerup app as the Trello User who is accessing the Power App. You are in there. 4.) You can only access Trello Card that you are a member of. Testing Account: Use any Trello Registered Account.